Of course, the other world-ending event that is coming soon is Christmas. Ok, this one is only world-ending if you haven’t purchased all of the gifts you need to buy and must visit the mall. After fighting for a parking spot for a half hour or more, you might start wishing the Mayan Apocalypse were real. 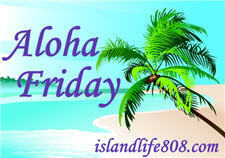 My Aloha Friday question for today is: Have you gotten all of your holiday shopping done or will you be braving the Apocalypse that is the mall at Christmas-time? As a bonus, here’s JibJab’s Year In Review, aka 2012, The End Is Here!